Matt Taylor was only 2 years old when camera crews arrived on Martha’s Vineyard in 1974 to film Jaws. 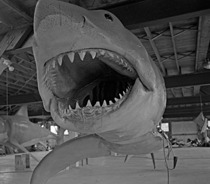 But when internationally renowned collector of movie memorabilia Jim Beller approached him in 2006 with an idea for a coffee-table book about the making of Steven Spielberg’s classic shark thriller, Taylor, a 15th-generation Vineyard resident, went door-to-door to find snapshots and other production artifacts that had gone unseen for over 35 years. It was an angle so fresh that Spielberg volunteered to write the book’s foreword, and we awarded the book, named Jaws: Memories from Martha’s Vineyard, a star. Kirkus also gave the book a Blue Star in September and named it one of their Best of 2011. Thanks to the openness of the sets, there isn’t a single major actor (including Bruce the shark) or crew member that was able to dodge the shutters of the eager locals. You really start to feel like you were there back in ’74 and now reminiscing with the family scrapbook about that big event that you were never a part of. 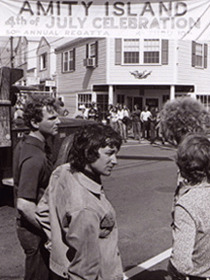 JAWS: Memories From Martha’s Vineyard is a time machine of a book.This is as close as any JAWS fan is going to get to actually being there with Steven Spielberg and crew. Beautifully laid out, with a text that is informative but also inviting, it’s more than eye-candy, it’s also a joy to read. 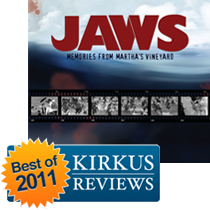 After receiving their Blue Star, Kirkus Reviews has now named JAWS Memories From Martha’s Vineyard one of their Best Books of 2011 in the Indie category. Read Kirkus Reviews’ earlier review of the book here. This is my favorite book release of the year and the definitive “must-have” of the holiday season! Alex Biese reviewed the book for the Asbury Park Press. Director Steven Spielberg’s classic 1975 thriller “Jaws” marked the birth of the modern blockbuster, and tales of its production are legendary — such as the difficulties of getting the prop sharks to work are nearly as well-known as the film itself. But for “Jaws” nuts and Spielberg superfans, “Memories” is something refreshingly new: a history of the film’s production told through the stories and photos of residents of Martha’s Vineyard, the charming Massachusetts vacation destination where the film was shot. Read the full review at Asbury Park Press. Todd Garbarini reviewed the book at CINEMA RETRO magazine’s website and interviewed Matt Taylor & Jim Beller! If this book is not the greatest book ever published about the making of a motion picture, I simply don’t know what is. It should set the standard for future publications on similar classics. It stands as a testament to not only a great motion picture, but as an authenticated record of what it truly takes to make a film and realize that film through a camera lens and most importantly, to be able to solve seemingly insurmountable odds and problems that inevitably beset a film crew. Read the full intervew and review at Cinema Retro. Bilge Ebiri at the blog “They Live by Night” interviewed Matt Taylor about the book. Of course, the culture at large has an image of Martha’s Vineyard as some kind of haven for wealthy elite types (witness the media silliness over Obama’s recent visit there) but its actual residents appear to be anything but. 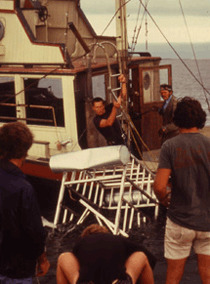 And Jaws is a film whose shoot was deeply intertwined with the community at large: town residents actually played parts in the film, and the film itself is steeped in a unique kind of atmosphere that no studio set would ever have been able to match. Visit “The Live by Night” to read the entire interview. John Soltes over at Hollywood Soapbox interviewed Matt Taylor about the book. I wanted to create something that felt like Rinzler’s Star Wars and Indiana Jones books — a book jam packed with all kinds of stories, photos and anecdotes. Mainly because the production of Jaws is so legendary and deserved, I felt, to finally be told through a combination of never-before-heard stories, and never-before-published photos. Visit Hollywood Soapbox to read the entire interview. Taylor has taken his love for a specific film and turned it into something greater—a beautiful compendium of not just memorabilia, but commentary on the importance of community in the art of filmmaking. Read the full review at KirkusReviews.com.